The Rise Of The Two-Headed Sharks: What Could Be Causing This Anomaly? - We Love Sharks! 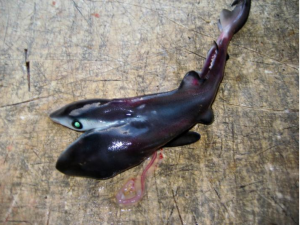 The Rise Of The Two-Headed Sharks: What Could Be Causing This Anomaly? - We Love Sharks! Since 2008, Two-Headed Sharks have been popping up and experts can’t say exactly what’s causing the problem. Though two-headed sharks may sound like something from one of those B-list movie productions, they are real. Even more perplexing is the fact that more of these mutant fish are turning up especially over the last few years. Scientists cannot pinpoint exactly what’s casing this anomaly but it would be safe to say that the reasons include the direct results of overfishing, genetic mutations, or chemical pollution, etc. Fishermen off the coast of Florida found a two-headed bull shark fetus. Another fisherman discovered a two-headed blue shark embryo while fishing in the Indian Ocean in 2008. Years later, a 2011 study led by Felipe Galván-Magaña detailed the discovery of two-headed sharks from the blue shark species. The specimen were caught in the Gulf of California and around northwestern Mexico. So far, blue sharks take the lead for producing the most recorded newborn two-headed sharks and embryos. The study concluded that this is due to the fact that blue sharks carry so many babies: often up to 50 pups at a time. 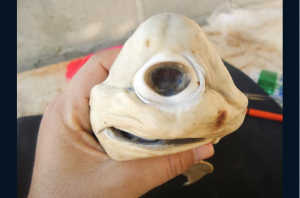 Galván-Magaña also reported seeing other mutated sharks like a one-eyed ‘cyclops’ shark caught off the coast of Mexico in 2011. This shark had just one functioning eye positioned at the front of its head. Such conditions can be traced to a congenital abnormality known as ‘cyclopia’ and it occurs in both humans and animals. More recently, a team of Spanish researchers including Professor Valentín Sans-Coma (University of Malaga) spotted the embryo of an Atlantic Sawtail catshark which had two heads. Actually, this is the first recorded occurrence of two-headed sharks among oviparous shark species (sharks that lay eggs). They later published their findings in the Journal of Fish Biology. Nicolas Ehemann, a marine scientist, recently also examined two incidents of two-headed sharks. They were a smalleye smooth-hound shark and then a blue shark. Incidentally, both fish were found in the same waters off Venezuela’s Margarita Island. Both animals were the first ever reported cases of two-headed sharks from the Caribbean Sea. Some Quick Facts About Two-Headed Sharks And Other Two-Headed Animals. The condition is referred to as polycephaly, derived from the Greek word poly (many) and kephale (head). Two-headed animals are called bicephalic or dicephalic. Normally, each head has its own brain but shares control of other organs and limbs with the other head(s). Such animals hardly ever live beyond a few months after birth. But a few do. The brains contend with each other for control, as a result, the animal tends to move around in a dizzy or disoriented manner. In some animals, the heads may regard the other head(s) as an enemy. For instance, in the case of snakes, one head could attack and even try to swallow the other one. The video below is by Discovery News and it shows some instances of two-headed sharks and other animals with similar mutations. What’s Causing The Increase In Two-Headed Sharks? Though extremely rare, the multiple-headed mutation in animals has been documented since the 1800s. There have been two-headed goats, sheep, snakes, and two-faced kittens, etc. But among sharks, this particular troubling trend appears to have started in 2008, when a fisherman, Christian Johnson, caught a two-headed blue shark embryo off Australia. Also, the numbers seem to be increasing. Could this defect be man-made? Some experts suggest that the increase in mutants among sharks may be a genetic response triggered by overfishing. Whereas, in the study by Professor Sans-Coma and others, the two-headed catshark they found was lab-grown. It had not been exposed to infections, chemicals, or any sources of radiation. Hence, the researchers believe that a genetic disorder was the most plausible cause in that instance. Of course, that’s not always the case. overfishing could led to higher incidents of inbreeding due a dwindling gene pool. A direct result of that would be genetic abnormalities. Two-headed sharks typically don’t survive birth. Though two-headed sharks are few and occur far between, it’s been difficult to study them further as they die very shortly after birth. For now, it still remains a puzzle as to what’s causing these mutations.